To make my favorite Indian dream a bit, I decided to surprise him and celebrate his birthday under a starry sky – it has kind of become his thing, stars, since we watched Cosmos on Netflix! Super excited (especially since this place was somehow accessible), I searched how to visit this thing at night. But they don’t do night visits anymore, only in daytime. It did seem kind of weird to watch stars in broad day light but in India everything was possible (and why else would they have daytime visit? ), so my brain didn’t dwell too long on this issue. All the more because my colleague confirmed it was a great place and you could see the stars there! The next step was to book a room not too far from Nainital. Especially not in Nainital, a small crowded bustling town that is not really charming for my taste. Fortunately there are a lot of ‘boutique hotels’ in the area. Soulitude knew how to seduce me, by its name, by its website mentioning ‘star gazing’ as an activity and by its room which had glass ceilings to see the stars. And there was only one room left when I booked three weeks in advance, I saw this as a sign! Finally the day came to go on our trip. We managed pretty nicely the 9-hour drive separating the mountains of Uttarakhand from Gurgaon. A smooth trip, with baby Samurai quite quiet. Immediately upon arrival we went for a walk; and I was a little worried because the sky was quite cloudy. 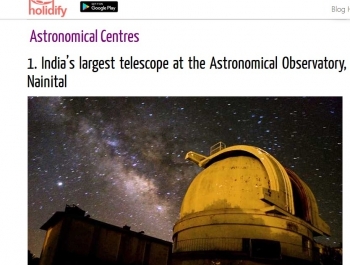 Okay Indians can do impossible stuff but even if they manage to see the stars with the Sun, I was pretty sure that clouds would be an obstacle! The next day, the sky is a bit clear and we drive two hours to go to the Observatory. At the time of the appointment, not one living soul in sight. Ah wait, I see a guard. Who, even if he doesn’t seem to understand what we are doing here, tells us that the team is having lunch and that it might take a while because they have no car and that the dining hall is pretty far. So we offer to do the taxi. The Chief Scientist assigned to us isn't here. Instead we have an assistant computer engineer. Showing us a little video on the history of the Observatory. Then he takes us to the beast. And... voilà! In fact of stars we got to watch a telescope. No comment. The hotel had no human scale telescope; as activity, they had just a guest coming regularly with his own material to take pictures. But the sky was beautiful, more than in Gurgaon. Even if the end of the winter (mid-February) is not the best season to go, as clouds form with the warming of earth. And also Soulitude is mostly just a name: it is built between two other houses, and work is ongoing. Nevertheless the hotel is very nice (especially our room a bit away from the main building), the staff helpful and the food very good. We both love the mountains of this corner of the India, so no regrets, it was a great weekend, one of those who comes with a price (namely a 2 day drive on Indian roads)! PS: Come to think if it, I must have mistaken between an Observatory and planetarium?